As a first step, the staging support beam were lifted by custom designed handling tools and brought into position. In a small warehouse in Peyrolles, about 10 km south of the ITER construction site, a key access structure for ITER in-vessel assembly is currently undergoing trials. It's a 30° degree prototype of ITER's in-vessel staging: a structure made of aluminium grating that will enable the assembly workforce to install components and tooling on the inside of ITER's vacuum chamber. While Michelangelo had to rely on a shaky wooden structure to paint the frescoes on the ceiling of the Sistine Chapel, the people in charge of mounting ITER's in-vessel components to walls of the steel structure will have something more robust. Four levels of staging will be installed during the assembly process to provide access to all interior surfaces. The staging has been designed to allow safe, fast and easy access to four levels inside the vacuum vessel. Its modular design will be adaptable to the different tasks that will take place in parallel in the vessel. No shaky structure for ITER: the complete picture of what the staging will look like when fully assembled. 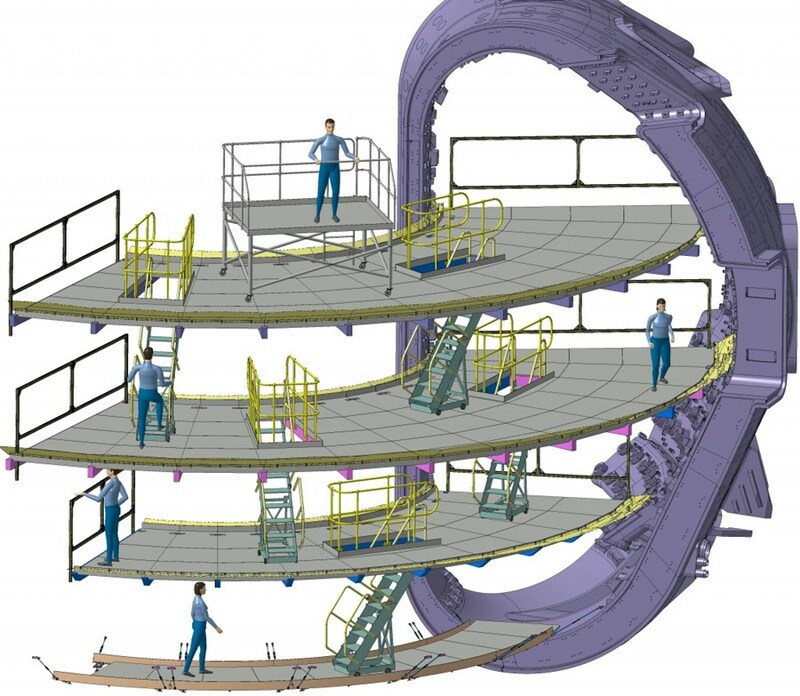 The staging will be used mainly for man access, but the structures have been designed to be strong enough to also support machinery and equipment such as weld sets and manual hoists. The staging can accommodate 70 workers at the same time during assembly. However, the number of persons at the same time in the vessel will be determined by the safety officers. 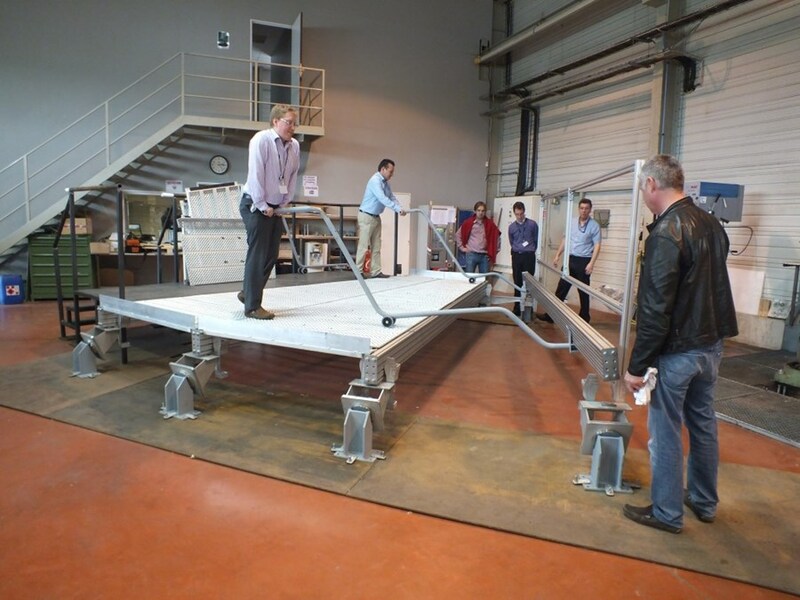 On 7 October, at the CSTI workshop in Peyrolles, where the prototype was manufactured, a small delegation from the ITER assembly team visited the company to test the installation of the staging and accept the prototype. Step by step, the delegation witnessed a 10° section extended to form the 30° prototype. Staging support beams were lifted by custom designed handling tools and positioned on adapters that—in situation—will be attached to the vacuum vessel wall via blanket support housings. The beams in place, the grating panels were then lowered one by one with the help of the same handling tools. 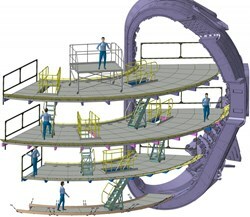 This is the sequence of tasks that, within the vacuum vessel, will be repeated to form a full 360° section of staging. For Mark Norman, who led the design work for ITER, the requirements to produce a design that was safe, lightweight, modular and adaptable to vacuum vessel tolerances was "quite a challenge" for the machine assembly design team. "The prototype shows that a good compromise was achieved and that the final design will provide a safe working environment to carry out the many installation tasks." Witnessing prototype assembly was also the occasion to highlight some potential problems with the supply of the floor panels, according to Myriam Le Page, Technical Engineer within the Assembly Section. The fabrication of the full staging floor is part of a package of in-vessel assembly tools for which the tender process is ongoing.